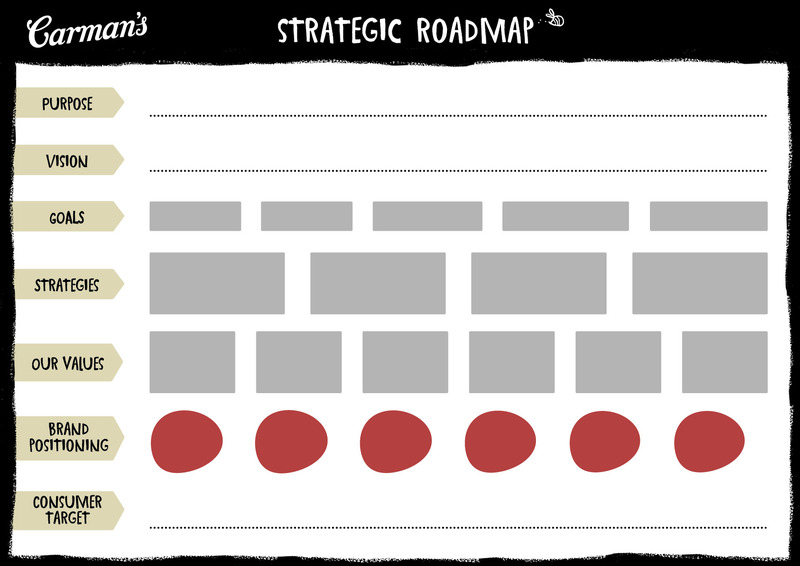 In the early days of Carman’s, a strategic roadmap template was a total lifesaver. I was just starting out and building my business, so a template gave me a place to summarise my thoughts and really helped formulate the overall Carman’s business strategy. Over the years, one of the most important things I’ve learnt (and now like to pass on!) is that ‘culture eats strategy for breakfast’. When you have a clear strategy in place, not only does it help strengthen and grow your business, it also helps foster great workplace culture. This is something I’m incredibly passionate about. Everything we do at Carman’s ties back to our strategic roadmap; from product development, quality management and sales, to marketing, finance and HR, each department of the business benefits from having the strategic roadmap as a reference point. It means that we’re all clear on what the Carman’s business goals are and can work collectively towards achieving them. Below you’ll find the strategic roadmap template that we use each year – this includes space for purpose, vision, goals, strategies, values, brand positioning and consumer target. Carolyn and the Carman’s team.